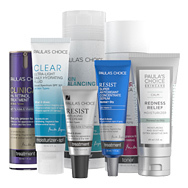 Home Expert Advice Skincare Advice Paula's Choice Product Tips Which Paula's Choice Skincare Collection is Best for You? As a general starting point, we often recommend our SKIN BALANCING and SKIN RECOVERY lines, which address the needs of the two major skin types, normal to dry and combination to oily. If you have redness-prone skin, our CALM products are the best choice. Our RESIST collection is perfect if you have advanced signs of aging or want to take serious steps to fight aging immediately. If you’re acne-prone, our CLEAR products are formulated to combat and prevent blemishes, while the PC4Men collection is particularly devoted to skin concerns involved with shaving. And, like PC products across the board, this collection also provides nourishing, restoring, and anti-aging benefits. Keep in mind that these are just general guides, however; all of our fragrance-free products are loaded with beneficial ingredients, and items from different collections can be mixed and matched to customize ideal routines for every skin type and set of concerns. We have two RESIST Anti-Aging skincare collections, both of which include the most comprehensive, proven mix of anti-aging ingredients you’ll find anywhere in the world of skincare. Products in the RESIST for normal to dry skin collection are more hydrating and emollient, while those in RESIST for normal to oily skin are formulated with light, fluid textures designed to minimize pore size, reduce oiliness, and fight post-breakout marks. We often say that age is not a skin type—so there’s no “magical” age at which you should start using anti-aging skincare, just as there’s no right age to start eating healthy foods (they benefit your health no matter your age). We believe you can’t start early enough when it comes to preventing the signs of skin’s aging. SKIN RECOVERY and SKIN BALANCING are collections oriented toward skin type, and are intended for those beginning their lifelong goal of keeping skin looking youthful, healthy, smooth, and flawless. These collections are anti-aging, but RESIST products focus on the more advanced signs of aging skin. SKIN RECOVERY is formulated for normal to dry skin, and has a brilliant range of beneficial ingredients with emollient, rich textures. SKIN BALANCING is designed for normal to oily and combination skin, so have more lightweight textures. Products in this collection are formulated to minimize pore size and reduce oil flow. Our CALM collection offers products for normal to dry skin and normal to oily combination skin. Every product is extra soothing for those with extreme sensitivity—and so gentle, they’re even suitable for rosacea-prone skin. Anti-redness, calming ingredients will bring flushed, sensitized skin back to normal while also fighting signs of aging. CALM for normal to oily combination skin also helps diminish pore size and normalize oil flow. CLEAR products are the best choice for those whose main skin concern is acne. These gentle, yet effective products work to perfect skin by clearing and preventing breakouts, clogged pores, and blackheads. They reduce excess oil without causing dryness, flaking, redness, or discomfort, and are available in two strengths, depending on whether acne is mild to moderate or severe. PC4Men includes products to help achieve a smooth shave and avoid ingrown hairs—concerns specific to men. But products in this collection also reduce enlarged or clogged pores, smooth bumps, and improve visible signs of aging—benefits anyone can appreciate. Best of all, they’re free the of skin-sensitizing, drying ingredients like menthol, peppermint, witch hazel, and eucalyptus commonly used in men’s skincare products, and terrible for every skin type. PC4MEN products are fragrance-free, hydrating, lightweight, soothing, and formulated for all skin types. Can I combine products from the various Paula’s Choice Collections? Depending on your skin concerns and skin type, you absolutely can and should combine products from different collections. We encourage people to customize their ideal skincare routines. Our products are formulated to work together, alongside our boosters and targeted solution products.